LEN - www.lankaenews.com | MR and prime witnesses suffering from ‘amnesia’..! -Judge orders CID to investigate the motive to hide evidence !! (Lanka e News - 22.Aug.2018, 11.30PM) The CID when reporting in connection with the abduction and cruel torture inflicted on Nation newspaper former deputy editor Keith Leroy Noyahr informed Mt. 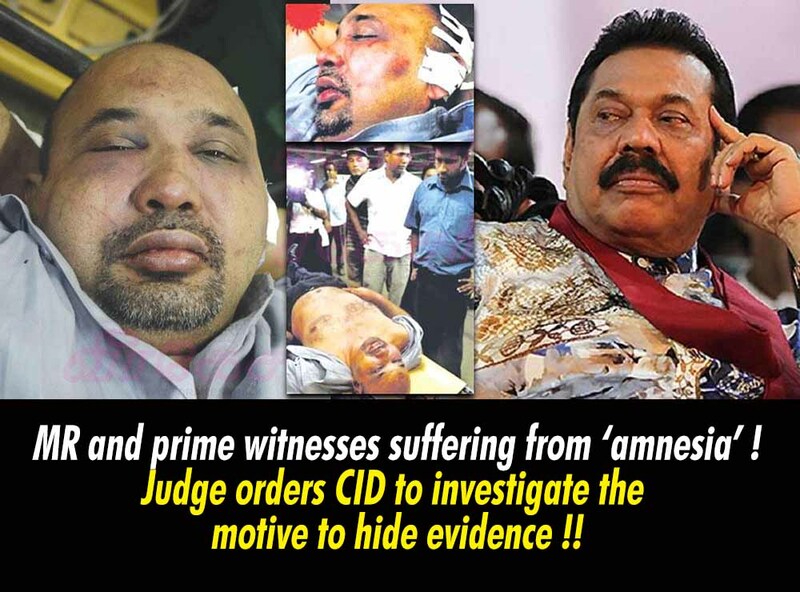 Lavinia court on the 20 th that the prime suspects including Mahinda Rajapakse (MR) are seemingly ailing from amnesia . The CID informed Mt. Lavinia additional magistrate Ms. Lochana Abeywickrema in open court that witness ex president Mahinda Rajapakse was sticking to the only answer ‘ I do not remember’ when he was interrogated , and therefore there is a need to probe into why there is a motive to suppress evidence. The additional magistrate thereupon ordered the CID to focus on and investigate why the prime witnesses are taking the ‘ I do not remember’ stance and seeking to suppress evidence . The senior state counsel Ms. Lakmini Girihagama making her submissions revealed in open court ,ex president MR in his statement to the CID had mentioned he does not remember there was a journalist by the name of Keith Noyahr. It was revealed by Mahinda during that period because there were a number of articles published by the media against the government and the forces , he does not specially remember a particular journalist , and speaker Karu Jayasuriya phoning about the abduction of Keith Noyahr to him too is not registered in his memory . Besides since he received so many calls, he does not specially remember this particular phone call. If Karu Jayasuriya has given a call, Mahinda said , the latter would have notified his secretary (presidential secretary then ) and the defense secretary to search for it , and that when he went to see a prisoner in jail , he met Anura Senanayake the IGP at that time . The magistrate told court ,in the statement of MR to the CID he had told that Anura Senanayake had said ‘there was a possibility at that time to get a prisoner released as soon as Gotabaya Rajapakse’s name was mentioned ’. According to reports reaching Lanka e News, MR had accused the CID officers who went to record his statement that ‘CID is making up cases’, and had questioned about what he himself told purportedly revealed by Anura Senanayake that ‘ as soon as Gotabaya’s name is mentioned it was possible to get a prisoner released?’ At that stage when the CID was trying to record that , the lawyers Sarath Silva , Ali Sabry and others clustered around MR had objected . Yet the CID recorded that statement ,and reported to court. MR inquiring whether releasing Keith Noyahr was wrong at the media briefing after his statement was recorded by the CID , and his statement to the CID that he does not remember there was a journalist by the name of Keith Noyahr are absolutely contradictory . One day MR will have to give answers in court in this regard. That day whether his cunning , mendacity , Machiavellianism and perfidious propensities will stand him in good stead is a matter for conjecture.